Hammondsport bed and breakfast travel guide for romantic, historic and adventure b&b's. 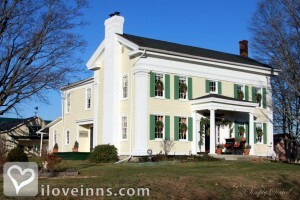 Browse through the iLoveInns.com database of Hammondsport, New York bed and breakfasts and country inns to find detailed listings that include room rates, special deals and area activities. You can click on the 'check rates and availability' button to contact the innkeeper. In the town of Urbana and located northeast of Bath, New York is the Village of Hammondsport. Hammondsport is a village in Steuben County. Visit this wonderful village and you will learn about Glenn Curtis and his magnificent contributions to the invention and development of the seaplane and the motorcycle. While in Hammondsport, attend the community theatrical production, partake in some hands-on art projects which the kids will surely enjoy, take an old-fashioned carriage ride or be more active and do some horseback riding. Try the Esperanza Boat Cruise or visit the Glenn Curtiss Museum or for some afternoon fun go to Maloney's Pub on Shethar Street. To know more about the area you can visit the Finger lakes Trails Visitor Center. Stay in the Hammondsport bed and breakfast facilities which are all over town. By Black Sheep Inn. Hammondsport is a quaint village at the southern tip of Keuka Lake in the lush Finger Lakes region of upstate NY. It is home to award winning wineries, aviation history and the great outdoors. By Black Sheep Inn.